Is it rational to call a $3000 camera a bargain? It is when it delivers nearly all the features of the company’s revered $5000 pro model, which is precisely the case with the Nikon D700. Basically the D700 takes the best parts of two established cameras and blends them seamlessly. The $5000 Nikon D3 contributes a full-frame image sensor with low-noise performance that makes previously impossible photos as simple as pressing the shutter. 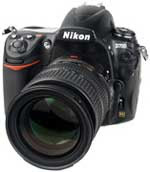 From the Nikon D300 comes a nearly unchanged body that’s hefty but nicely balanced, tightly sealed against the elements and nearly 20% lighter than the D3.